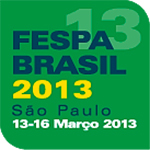 We will be exhibiting at the FESPA Brasil Trade show which will run from 13th to 16th March 2013. It will be taking place at the Expo Center Norte - Blue Pavillion in São Paulo, Brazil. For more information on the show, please click the show logo below.